A sound-rich immersive journey along the mighty Congo River in the Democratic Republic of Congo. A journey in sound along the mighty Congo River in the Democratic Republic of Congo. This adventure, using cutting-edge binaural audio, transports you to the heart of the country on the eve of long-delayed elections. You’ll encounter busy ports, vibrant markets and rare gorillas. You’ll learn why this mineral-rich country the size of western Europe is so poor. 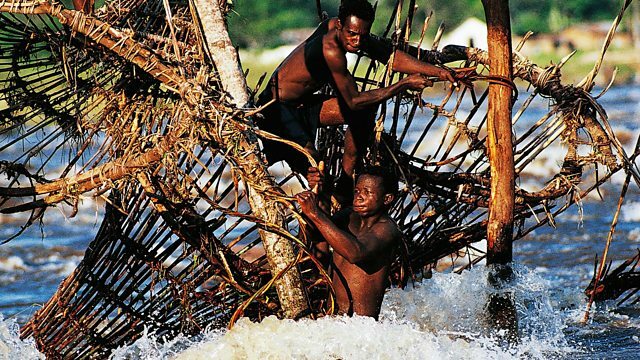 You’ll ride on the river to the soundtrack of its music, meet its wrestlers, its acrobatic fishermen and explore how history has shaped what the Congo is today. You will travel into the heart of the Ebola outbreak with United Nations peacekeepers, go hunting with pygmies, wander through former President Mobutu’s ruined palace in a town trapped in time, and explore the cobalt mines which will drive the electric cars of the future. So put your headphones on, shut your eyes and let Alastair Leithead, the BBC’s Africa Correspondent, take you on an epic adventure in sound in the Democratic Republic of Congo.